Hard to believe that it is almost the end of May already! Weren't we just buried in snow yesterday? We have been getting our garden planted and have been enjoying fixing up the yard for the summer. Getting things ready for the summer is always something that we enjoy and our children love being involved. So, with it being May that means one thing. It is Celiac Awareness Month! Fortunately, our family doesn't suffer from this or any other food-related allergy or disease but I know several people who do and it isn't a fun thing. People who deal with Celiac Disease have to be so careful what they eat and even, what their food touches. If their food comes in contact with anything containing wheat or gluten products, they can get very sick. I have a good friend who is like this and it is difficult for her to get people to understand just how sensitive she is to gluten. I have reviewed Gimbal's Fine Candies here on my blog in the past and let me tell you...that candy didn't last very long! My children love treats. :) My husband also has a pretty big sweet tooth and he especially loves gummy type candy so he was also in the candy quite a bit. Jelly beans are his "veggie" of choice (along with candy corn) and we always laugh about that when we have a bag of jelly beans laying around. Sour Lovers are basically gummy hearts that are covered in a sour sugar. They consist of 12 different flavors, from Bing cherry to Meyer lemon, each bag is bursting with flavor. 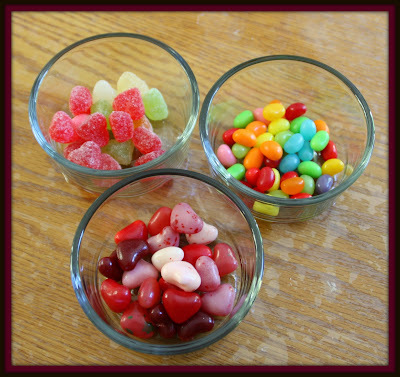 The Sour Gourmet Jelly Beans (made with real fruit juice!) also have 12 different flavors in each bag and these are definitely for the person who loves sour candy! 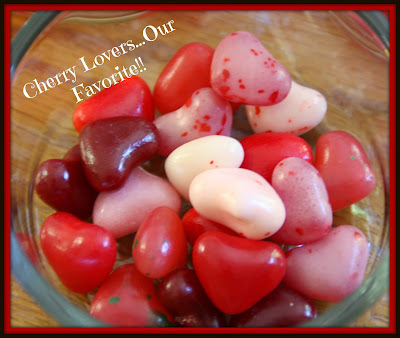 When I asked my children to pick their favorite out of the three bags, they chose Cherry Lovers! I have to agree with them. While the other flavors were super yummy, the Cherry Lovers were the number one hit. These are about as "everything cherry" that you can get. Flavors include wild cherry, cherry vanilla, black cherry, chocolate cherry, cherry cheesecake, cherry Daiquiri, cherry cola, kiwi cherry and bing cherry. These flavors are AMAZING and my children loved them. My three little taste-testers were all too willing to try out these candies from Gimbal's and I have to say, once they tasted them I had a hard time getting them to stop. Making snacking fun doesn't have to be complicated...just grab a bag of Gimbal's and dig in! The 13 ounce bags that I received retail for about $4.29 but you can certainly pick from a variety of sizes, including a 38 oz. jar. Make sure you check out Gimbal's on Facebook to stay current with news and other fun stuff. Disclaimer: I received no monetary compensation for this post. I did receive free Gimbal's Fine Candies for review purposes. All quotes and stock photos are from the Gimbal's website and email. Prize is being provided and shipped by the sponsor. This blog is not responsible for lost, stolen or damaged prizes. All thoughts and opinions are 100% mine. It would be a tossup between cherry lovers and gourmet jelly beans, I think. Too close to call. I'd like to try the All Natural Licorice Scotties. I would like to try the Sour Gourmet Jellybeans. 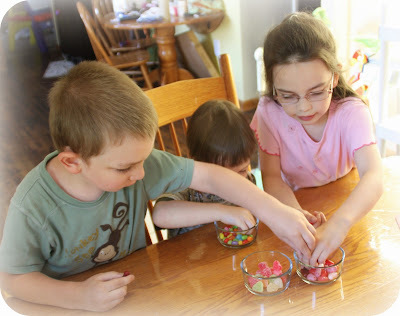 We love Jelly Beans! I'd most like to try the Gourmet Jelly Beans. Thanks so much. I would love to try Cherry Lovers. My husband would love their Lava Balls candy. We love the Cherry Lovers! Would be hard to pick one. I like both the cherry lovers and cinnamon lovers. I would love the cherry lovers jellybeans. I would like to try the Licorice Scotties. I love black licorice. 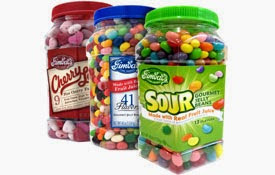 I would like to try the new Sour Gourmet Jelly Beans made with real Fruit Juice. That little girl's face was priceless. I would love to try the gourmet jelly beans. We would enjoy the dark chocolate cherry chews! I would want to try the Chewy Cinnamon LavaBalls- LOVE that spicy! I would most like to try the Cherry Lovers fruit chews from Gimballs. I would love to try the Gourmet jelly beans! i have to go with the All Natural Licorice Scotties. . I would love to try the Chocolate Cherry Lovers Fruit Chews. Mmmmm I like the sound of the Gourmet Sour Jelly Beans! Yum! I'd love to try the LavaBalls! 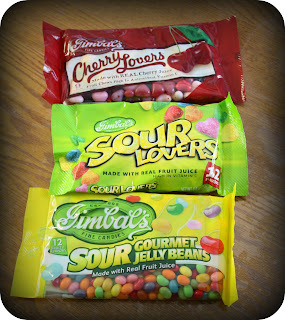 I want to try the sour lovers candy! I'd like to try the Licorice Scotties. I would like to try the Cherry Lovers. id like to try their gourmet sours! I like the gourmet jelly beans. I would like to try thto red scotties. Chewy Cinnamon LavaBalls sound so good. My favorite is the cherry lovers.